The longer and warmer days near the end of winter signal that it’s time to start thinking about your first tire change of the year, as your winter tires will soon need to be flipped over to all-seasons. Unfortunately, you cannot drive around on the same types of tires all year long. Winter tires and all-season tires are made with different rubber compounds. The rubber in all-season tires is better suited to temperatures above 7 C, while the rubber in winter tires is better suited to temperatures below 7 C.
Winter tires remain flexible even in freezing temperatures, helping to better grip the road and provide drivers with traction. They are also far better at gripping snowy and icy surfaces, on which all-season tires have almost no chance. The problem is that winter tires then become too soft in warmer temperatures and are not ideal for driving around on warm, dry pavement. When the rubber that makes up winter tires become too soft, it begins to wear much faster. As the tire makes continual contact with the warm pavement, it grows hotter and hotter and can eventually start to chemically degrade. This chemical degradation can actually cause the outside of the tire to become somewhat greasy and even less capable of properly gripping the road, thereby making it more difficult to break and increasing stopping distances. The rubber which makes up all-season tires, on the other hand, is made to withstand heat. All-season tires are flexible yet firm enough in warmer temperatures so as not to wear down as fast and to provide proper traction in a variety of spring, summer, and early fall driving conditions. While you should definitely be astute about changing your tires when winter finally seems to be on its way out, you also need to be careful not to rush and do it too early. Depending on where you live, a temporary warm-up might still be followed by freezing temperatures and significant snowfall. Your winter tires aren’t going to start degrading after a few days or even a couple of weeks of casual driving in positive, single-digit temperatures, especially if temperatures still dip below freezing at night. Rapid tread wear will only begin to occur once spring is fully in bloom and there is no more risk of snow and ice. You’ll want to make the change to all-season tires once daily low temperatures are consistently above 7 C and there doesn’t appear to be any more heavy snow on the horizon. Don’t worry, your all seasons should be able to handle a light, overnight dusting of snow should one catch you off guard once you’ve already flipped your tires. Just keep your eye on the forecast and you’ll have no trouble deciding when it’s the right time to switch over from winter to all-season tires. 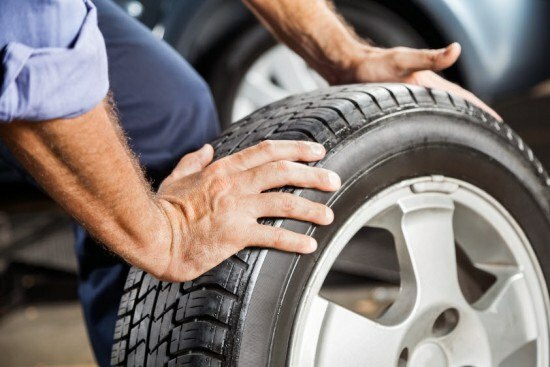 Once it looks like the cold and snow are gone for good, either change your tires yourself if you know what you’re doing, or book an appointment with a professional to have it done right.